Static window clings, or window clings, are very similar to clear window decals Window Decals Window decals, similar to Vinyl posters, are smooth and often adorn fast food centers and cinemas. It provides a magnificent look to any indoor or outdoor surfaces. Window decals are printed on white material comes with pre-glued back for easy peel-and-stick application on any smooth surface. This is made out of quality material which provides clarity and improved visibility. Unlike hanging banners, Window Decals do not require holes, grommets, strings or nails. Best suited for indoor use, yet they can also be used at outdoors. Other than this, window decals are popularly used as car decals. except the adhesive back on clings has static glue for very easy removal and reuse. Allow your imagination to go wild! Transform your windows and doors with artistic custom window clings. There are so many places where you can use custom window clings. 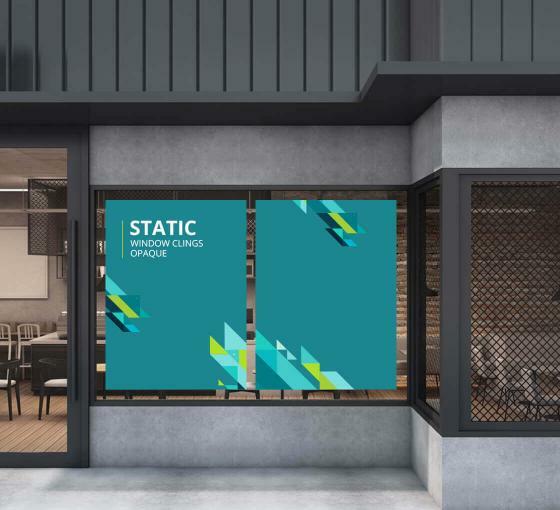 Beautifying a glass front, giving a make-over to a dull scratchy window of your house or car, putting an advertisement on your shop front, softening up the incoming sunlight, enjoying a little privacy without losing natural light all are options if you opt for static window clings! A large variety of designs and patterns are available with our window cling printing. You'll be able to decorate your windows with a creative flair. They are similar to vinyl decals or window decals. These clings are printed on high strength clear vinyl material for both outdoor and indoor use. The design consists of the color white, which comes out as black/clear as printed, and doesn't print white. Our static window clings come with pre-glued backs and easy peel-and-stick application. Our window cling printing service digitally prints at 720dpi to 1440dpi resolution in full color. Signs of more than 4 feet in height and width come in two pieces, which helps with easy installation. Enjoy the quick and simple installation of our custom window clings! Many installation videos are available on YouTube for reference. If you want your custom window clings to be applied inside of the glass, please mention in the special instructions on your order. No additional charge.